Almonds, coconut, honey, glucose syrup, rice flour, soy lecithin, chicory root fiber, sugar, sea salt. Contains almonds, coconut and soy. Contains almonds, cashews, pecans and soy. Almonds, cashews, pecans, apples, glucose syrup, honey, raisins, rice flour, flax seed, soy lecithin, chicory root fiber, sugar, cinnamon, sea salt. Cashews, almonds, chicory root fiber, blueberries, honey, rice flour, glucose syrup, raisins, sugar, vanilla extract, soy lecithin, sea salt, natural flavor, citric acid. 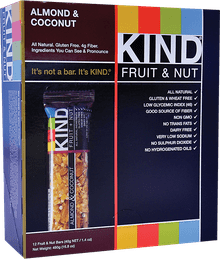 Contains almonds, coconut, and soy. Almonds, coconut chips, honey, glucose syrup, palm kernel oil, chicory root fiber, sugar, unsweetened chocolate, cocoa powder, rice flour, soy lecithin, salt, madagascar vanilla, natural flavor, cocoa butter. Contains peanuts, almonds, Brazil nuts and soy. 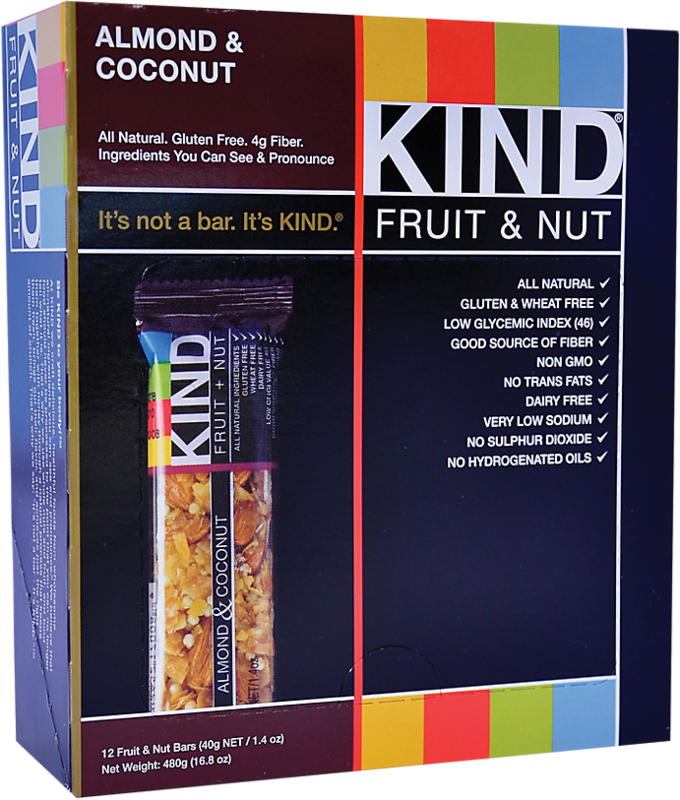 This bar contains 7g sugar; the average nutrition bar contains 12g sugar. Mixed nuts (peanuts, almonds, Brazil nuts, walnuts), Dried Fruits (raisins, apricots [apricot paste, glycerol (vegetable based), pectin, citric fiber, citric acid], dates), honey, chicory fiber, non GMO glucose, puffed rice, flax seeds, soy lecithin. Eating two Kind Bars a day may help control your weight. Allergen Information: Manufactured in a facility that uses peanuts, Brazil nuts, walnuts, almonds, sesame seeds and soy. May contain pits or nut shell fragments. Contains peanuts, tree nuts and dairy. May contain pits or nut shell fragments. Mixed nuts (peanuts, almonds, brazil nuts, walnuts), honey, sugar, dried fruit (sultanas, dates, raisins), non GMO glucose, palm kernel oil, crisp rice, apricots, apple juice, whey, skim milk, powdered yogurt, vegetable glycerine, flax seeds, soy lecithin, chicory root fiber, vanilla, citrus pectin, natural apricot flavor. Peanuts, almonds, glucose syrup, honey, sugar, strawberries, cranberries, rice flour, peanut butter, soy lecithin, chicory root fiber, salt, ascorbic acid, natural flavor. Contains peanuts, almonds, and soy. Cashews, almonds, glucose syrup, peanuts, honey, cranberries, sugar, rice flour, raspberries, chicory root fiber, chia seeds, vanilla extract, soy lecithin, natural flavor, sea salt. Contains cashews, almonds, peanuts and soy. Made in a facility that processes tree nuts and sesame seeds. May contain nut shell fragments.